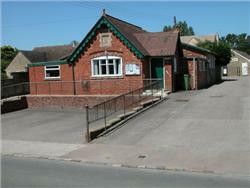 Welcome to the Gotherington Village Hall Website. On this site you can find out how to hire the hall, it's history, and what's going on - including our vibrant monthly coffee mornings. Gotherington Village Hall is run by the members of the village hall management committee who are elected annually as trustees under the jurisdiction of the Charity Commissioners. The Village Hall Committee are responsible for the upkeep and the running of our wonderful village hall, which is used by so many in our local community. Please do come along and meet us at our AGM! We are always looking for new members to get involved. Cricket being played at Freeman Field in the centre of the village, named after village stalwart David Freeman who was instrumental in securing the land for the pitch in 1965. Gotherington railway station was a railway station serving the village of Gotherington in Gloucestershire, England. The station is located just to the north of the village and it is on the former Cheltenham to Stratford-upon-Avon line, which was opened by the Great Western Railway in 1906. The station opened as Gotherington on 1 June 1906; it was renamed Gotherington Halt on 1 December 1940 and closed by British Railways in 1955. The restored Gotherington railway station is now on the Gloucestershire Warwickshire Railway.